An extremely rare alpine from China that is found in valleys that have little or no frost throughout the Yunnan. The name amoenum means "pleasing", and it is. First collected by Augustine Henry in 1897 at Mengtz in the Yunnan, in nature it is found on the edges of woodlands, grassy plains and along side thicket margins. L. amoenum usually only produces 1 to 3 flowers that are lightly fragrant and in nature open in June with seed ripe in late August. 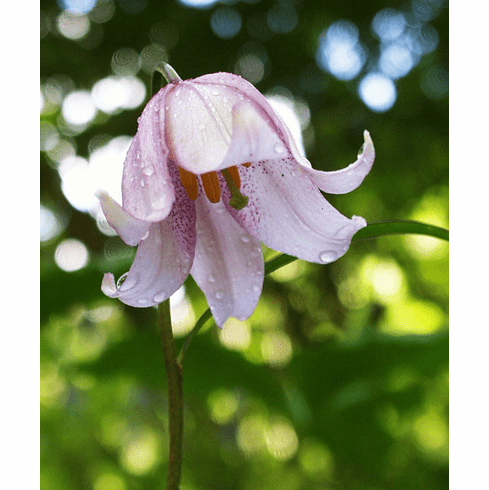 A problematic lily that is endemic to a very small region of the Yunnan, in the garden it can die for no reason and does not produce seed readily. In nature it is found in nearly frost free valleys up to 7,000 feet elevation. This rare beauty was photographed by G�te Svanholm of Sweden and provided to us by Pontus Wallsten, his friend in Switzerland. Photo inset shows a more intensely colored form and is courtesy Wikimedia Commons and was submitted by Thorkild Poulsen. Original photo cropped. This file is licensed under the Creative Commons Attribution-Share Alike 2.5 Generic license. Thank you Thorkild for sharing this wonderful photo on Wikimedia Commons. G�te Svanholm photo copyrighted by G�te Svanholm, all rights reserved. Used with permission.